Ok, I admit it; I have a man purse. I know it’s unmanly to call it a purse so it is commonly referred to as “the man bag”. When it comes to purse carrying liberation, us men haven't quite leaned in enough to know that we need a purse. All guys know that bulging pockets aren't cool and you just can't fit everything you need in that tiny wallet. My man bag started off as a cheap sort of brief case for work, but has quickly moved beyond just work and has now become an essential companion for day trips and travel. The reason for this is that I can rely on it to contain my most common daily staples and it also provides a container for as needed items as well. 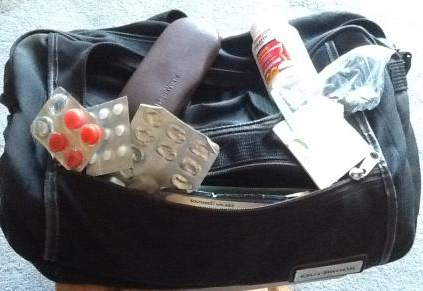 In this post, I am going to review some of the treasures contained in my man bag. Some will sound obvious and some not so obvious. Cell phone: I'm not a “phone” person and don't like having a phone hanging off me or bulging in my pockets, but I like to know it’s there in case I need it. Pens and a few post-its: Whether to make yourself a quick note or leave a note for others. Earbuds with microphone: Yes, these can be used with the cell phone (or iPad), but beyond that I have found a comfortable pair that can also double as ear plugs (no, I'm not listening to music; I'm simply not listening to anything… silence is golden). I used these to survive my daughter’s dance competition as the music was just too loud. Spare plastic bag: It is amazing how often a plain plastic bag can save the day. For example it can be used to hold a water bottle so the condensation is blocked from other items in your bag or to separate other items that may temporarily ride in your man bag. Plastic spoon, fork and knife and napkins: Ever eat out at a busy spot and either they forgot to include eating utensils or you find that the kiosk has been over-run and there are no more utensils out? Tissues: Essential for any allergy sufferers. $20 in $1 dollar bills: This is helpful so that you are always ready with tip money OR when you encounter one of those cashiers that need ones OR when you forget your wallet and need some petty cash for lunch. Spare credit card: Great for emergencies in case you forget your wallet. Spare change: Yes, you may still encounter parking meters or vending machines needing coins. Tylenol (or pain reliever of your choice): Essential not only for yourself, but also often appreciated by family and colleagues. Assorted medication based on health issues: For me this includes an array of cold and allergy medications as well as medication for acid reflux. Dental floss / picks: I have crowded teeth and there is nothing more irritating than having to go a day with food stuck in your teeth. Band-Aids: Even a paper cut can be annoying when you are bleeding all over the place. Other: I also include spare sunglasses and a mini-umbrella so that I’m prepared for anything. iPad: This has become essential for travel. Other: Bottled water, Chargers for cell phone and / or iPad, Book / reading material, Fiber and vitamins, Snack items, protein or granola bars, fruit, etc.